Morgantown WV Injury Lawyer – Articles from our Morgantown Personal Injury Law Office about safety issues, insurance law, auto accidents, personal injury claims, and other legal issues in West Virginia. Questions? Call 304-594-1800 or after hours, 304-216-6695 today. The Morgantown Mediation Center, an elegant solution for all mediation and small conference needs in North Central West Virginia, will be available starting in August 2018. Located in the Ridgeview Business Park, the center is convenient to I-68 and I-79. Parking is free and fully accessible. Three conference rooms are available in the Mediation center, and up to six separate rooms can be booked for your next legal mediation or settlement conference. Attorney Jeff Robinette is available as a mediator for personal injury, professional and medical malpractice, and contract issues. Based on availability, Mr. Robinette would be pleased to serve as your mediator, and of course you are always free to choose your personal favorite for mediating your legal settlement proceeding at the Morgantown Mediation Center. Book your next mediation at the Morgantown Mediation Center. A car accident is a traumatic event, and for some, life is suddenly drastically different in one moment. There is a broad spectrum of events that could contribute from financial hardship to life-altering injury, to the passing of a friend or family member. All these sudden issues are difficult and overwhelming at first, but as time passes, it usually gets gradually easier. For some, however, depression can develop, and the passing of time does not decrease the difficulty. This is a condition that, like an injury, needs to be attended and not ignored. Depression is a difficult period of life in which your mind and emotions are greatly affected. You should not try to fight the battle on your own. You need responsible friends and family members that you can trust to help and support you. View depression as an illness rather than a deficiency. Communicate your thoughts and feelings to your trusted friends and family, and let them help you through the difficult times. Since your emotions are affected, they may be able to better identify problems and know if you need to seek a doctor’s care. This can make you feel better in some ways and worse in others, but it is important for recovery. No matter the source of your depression, it is probably a circumstance that might never be ideal again. While this can be upsetting, bring this up in your mind and talk out your feelings to yourself and trusted friends and family. You may even need to find a trustworthy counselor, like a pastor, pastor’s wife, school counselor, or other professional. Be honest about your feelings. In doing this, you will have to face the source of your depression, but if you are truly facing reality, you will see that there is still a lot of good in life, and in time, there is still a lot of good that you can do. With depression, it is easy to take poor care of yourself, but be sure you eat plenty of healthy foods, rest, have good hygiene, and take your medicines on time. Also, these steps contribute to staying in a daily routine. Depression makes it difficult to be motivated, but a routine helps you to keep moving, which is a crucial step to battling depression. Many people who battle depression feel constantly fatigued. They don’t want to get up and do anything because it does not feel like it would be worth the effort. The best action to fight this fatigue is to get up and get moving. Simple exercise, like walking, can help to reduce feelings of fatigue after a short time. Once you get started, you may feel like you cannot do it, but keep going and the feeling will gradually subside. A couple ways to make walking even more beneficial is to walk with a friend and to walk outside if the weather is nice. Do you have something you enjoy doing, like crocheting, cooking, gardening, or writing? If you do, take some time to do these activities. If you don’t have a hobby yet, find one. Think of something that interests you, and pursue it. This type of activity will usually keep your hands and mind busy, and after a while, you have a beautiful completed work to show for it. If you are stuck when trying to think of a hobby, there is a huge list on Wikipedia to help you get started (https://en.wikipedia.org/wiki/List_of_hobbies). This is very difficult to begin while battling depression, but getting out and helping others is a great way to find fulfillment. This might be another area where another trusted friend or family member could help. You and this trusted person could go together and find a place to volunteer. This accomplishes so many things that greatly help with depression symptoms. You are a valuable creation whether you find ways to help others or not, but volunteering your time and talents can help you to see just how valuable you are and how helpful you can be to someone else. This advice goes completely against the grain of depression symptoms, but making an effort to have a good attitude can help recovery from depression. Remember that depression is an illness and it needs to be treated like an illness. With physical illnesses, it is very important to believe that you can recover. Depression is no different. Believe that recovery is very possible and that brighter days are coming soon. While having a good attitude and positive outlook on recovery is important, realize that complete recovery from depression will not happen in a day. Some days will be harder than others. This is discouraging, but it is to be expected. Instead of just enduring those difficult days, make a plan for yourself. Being faithful in completing your daily routine is a great place to start. Have some other activities in mind for these especially difficult days. Maybe you could visit an elderly person or call a friend. Interaction with other people is important on these difficult days. Keep reminding yourself that recovery is coming, but that it can be slow. Depression is difficult, no matter what the source is. There are no two cases exactly alike, so the best way to treat them will be different, but following these steps is a good place to start. Be sure to allow support from trusted family and friends as they can be your most valuable asset in this journey, and remember that with time, recovery is very possible. Can Caffeine Replace Sleep for Drivers? It’s Monday morning at 6:15 a.m. The alarm is going off for the fourth time this morning after you’ve hit the snooze three times already. You know it’s time to get up and face the world, whether you are ready or not. You stumble through the morning routine of getting ready for work, pour the coffee from your pre-programmed coffee pot into your thermos, and you are out the door. The drive to work is hazardous, as is any trip down the road, but here in just a few minutes, the caffeine from that first sip of coffee will begin to take effect, and you will be wide awake and alert as you drive. Maybe you will feel alert, but can caffeine really replace a good night’s sleep for drivers? Caffeine, commonly found in coffee and tea, is the world’s most popular stimulant. When consumed, caffeine blocks the body’s A1 receptors, which makes the person feel more awake and alert, and caffeine blocks the body’s A2A receptors, increasing dopamine, and causing a stimulating effect. Simply, caffeine makes the consumer feel more awake and alert, and helps them accomplish tasks more quickly and efficiently. However, the effects change when caffeine is consumed regularly. If caffeine is consumed more than about twice per week, the consumer can become addicted and the effects will be lessened. The effect of feeling more awake and alert does not seem to change over time. If someone drinks coffee every morning, it will help him feel more alert every morning. However, the stimulant property of caffeine lessens with tolerance. The consumer may feel able to accomplish tasks more efficiently, but in reality, he is prone to make more mistakes and possibly cause a collision. An interesting study was done by Utrecht University in the Netherlands, which tested the effects of caffeine on well-rested drivers. In the study, 24 well-rested people drove on a monotonous highway for two hours, then had a 15-minute break in which they drank coffee. One group had regular caffeinated coffee, and the other group had decaffeinated coffee. Then, they drove for another two hours down the monotonous highway. The results were clear that the group that had the caffeinated coffee objectively drove more steadily than the group with decaffeinated coffee, and the caffeinated group subjectively reported feeling more alert and in control of the vehicle than the group with decaffeinated coffee. Certainly, the caffeine had a positive stimulating effect. However, as is seen in the next section, the findings are different for people who are sleep deprived. Another study was done to see how people’s performance compared with caffeine, with a nap, or with neither. All three groups were trained in an exercise to perform a task during the morning. In the early afternoon, one group took a 90-minute nap, while the others were doing a relaxing activity (but not allowed to sleep). After 90 minutes, the nap group was awakened, and the other two groups were given a pill. One group was given a caffeine pill, and the other group was given a placebo. Then, the groups were tested on the tasks they had learned in the morning. As you may have expected, those who took naps did much better than those who used caffeine. This could be attributed to the finding that sleep increases memory and motor skill function. However, the very interesting finding in this study was that those who had the placebo outperformed their caffeinated counterparts in the given tasks. Clearly, the stimulant effect of caffeine was not beneficial to the consumers when they began to feel fatigued in the afternoon. It can be deduced from the above study that caffeine is not likely to be helpful for sleep-deprived drivers. In fact, driving without caffeine at all is probably safer, even if the driver feels sleepier. The study that follows brings some alarming findings regarding caffeine consumption before driving. The Institute of Advanced Motorists has said that a study showed that caffeine consumption is dangerous for sleep-deprived drivers. 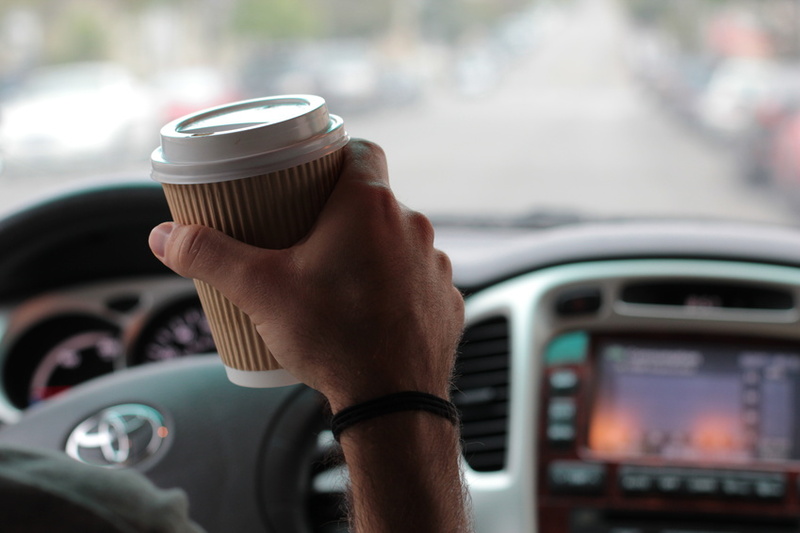 The positive effects of caffeine on their alertness while driving is very temporary, and when the caffeine begins to wear off, the safety of the motorists’ driving plummets. Actually, it was said to affect their driving in a way similar to alcohol. Typically, when consumers begin to feel the effect of caffeine waning, their response is to consume more caffeine. However, this is not effective. As was discussed earlier, when caffeine is overconsumed, the consumer feels more alert, but the stimulant property cannot be repeated indefinitely. In fact, this study showed that using caffeine for only the second time within a few hours did not provide a stimulant effect. In short, that thermos of coffee in the car on Monday morning is not a good substitute for simply going to bed earlier on Sunday night. While caffeine has a positive effect on safe driving for rested motorists, it has a significantly negative effect on sleep-deprived drivers. The true danger in caffeine consumption in conjunction with driving is that drivers think they are more alert and able to drive more safely when they are less equipped to drive safely. Following tips like these will make you feel better the next morning, and make your drive to work safer with or without caffeine. Hands-free is not risk free! Distractions are a top factor in fatal car crashes, and the percent of these fatal crashes is increasing, not decreasing. Reversing a 40-year trend of decrease, in 2015 fatal vehicle crashes were up 7.5% and up 8% in 2016. According to Accident Attorneys, a National Safety and Legal Resource for personal injury attorneys and those seeking such legal assistance, improved car safety technology and driver education contributed to the decrease in fatalities in past years. As gas prices have dropped and use of electronic devices while driving has increased, the increase of roadway deaths has also increased. The NHTSA reports that 10 percent of all fatal crashes involving young drivers (ages 16 to 24) resulted from distracted driving. The most amazing thing happened along I-30 this week when a tractor-trailer sideswiped car also traveling down the the interstate, tearing the door off the vehicle and causing the car to flip. The driver, a mother, and her baby were ejected from the vehicle. 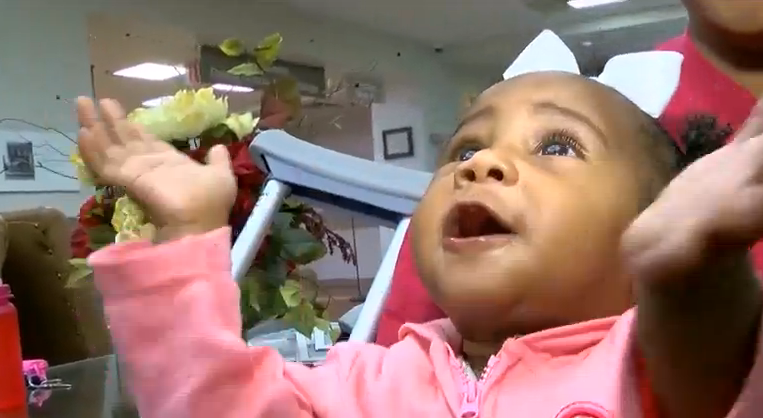 Her car seat was soon found, but the infant wasn’t in it. A short time later, a good samaritan who was searching the area heard some noises from some piles of hay alongside the highway. 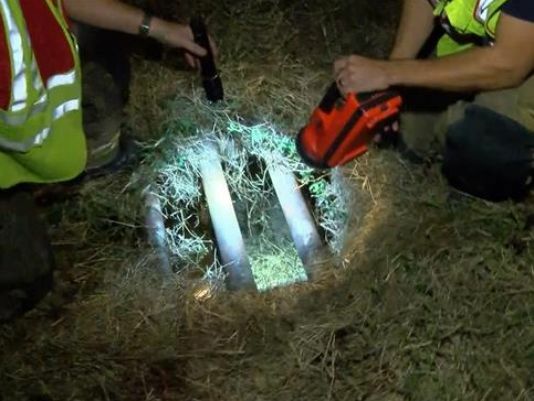 He continued his search, and found that an eight-month-old baby was sitting up in the bottom of a drainage ditch, holding out her arms to be picked up. She wasn’t screaming, wasn’t crying… merely waiting. The drainage ditch was about 25 feet from the roadway. It is imagined that the baby rolled down the hill after the semi hit the car and caused the accident, and landed in the drain, sustaining only a scratch on her forehead. It took three firefighters to get her out. The mother and four other people were taken to the hospital for more serious injuries. Police confirmed that the child was not properly restrained in the car seat at the time of the semi-truck accident and that the car seat was also not properly installed. The driver of the truck was cited for an improper and unsafe lane change. Miracles can and do happen, but you can’t count on a miracle to save your child in the event of an accident. Make sure your baby is properly secured in the car seat, and that the seat itself is securely fastened into your vehicle. Read the car seat instruction manual and the portion of your vehicle’s owner’s manual on car seat installation. Every car seat needs to be installed using either the lower anchors of the LATCH system or the seat belt to secure it in place. If you choose to use a seat belt to install your car seat, pay close attention to how to lock your seat belt in the vehicle owner’s manual. Because every car seat and vehicle is different, it’s important to follow all instructions carefully. Place the car seat in the back seat of your vehicle and follow the manufacturer’s installation directions. If it is a rear-facing seat, make sure the car seat is installed at the correct recline angle. Most car seats have built-in angle indicators or adjustors that help with this step. 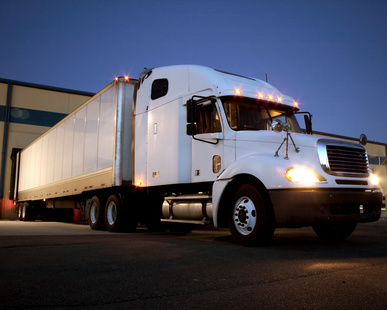 The federal department of transportation guidelines for commercial motor vehicles provide explicit directives and warnings regarding the safe operation of tractor trailers. An empty tractor trailer can stop quicker and respond faster to emergencies on the road than a fully loaded one. Night driving dictates even more safety precautions because a tractor trailer operator can only respond to emergency situations he observes — if his speed exceeds the illuminated area of his headlights, then the driver will not be able to safely respond to an emergency situation until it is too late which may cause a fatal truck accident similar to the many devastating collisions we hear about on I-79 and I-68 near Morgantown. During daytime driving, the visibility may be a quarter mile ahead, so a driver can see and anticipate how to respond to an emergency situation in time to avoid a collision. At night, the illumination may only give a driver 200 feet of visibility, but his speed at 70 miles per hour may require every bit of that distance to stop his truck, depending on his load weight and road conditions. If the driver is exceeding the posted speed limit at night, he won’t be able to see problem areas ahead in time to stop safely — hence, his stopping distance will exceed the illumination distance of his head lights. It is quite obvious which tractor trailers are loaded on an uphill grade, but on level ground and certainly going downhill, heavily loaded trucks are especially vulnerable to collisions because they have little ability to slow down if there is an emergency situation ahead of them. While there are many exceptional truck drivers who take great care to keep the public safe, there are others that exceed safe speeds, tailgate passenger vehicles, and fail to keep their trucks mechanically safe for operation. In investigating fatal truck accident cases, it is imperative to pursue facts that point to truck driver fatigue or other types of negligence. Driver logs must be examined, hotel receipts, GPS devices, black box evidence, dash cam videos, and other sources of evidence that paint a picture of the circumstances leading to the accident. This thorough approach gives the best possible chance of obtaining favorable results for an injured person or a family after filing a wrongful death claim after a fatal collision. These big-rig truck accidents are the result of the volatile combination of speed and weight, causing a situation which is too often much more devastating than any other type of vehicle collision. If you need assistance with an insurance claim regarding a motor vehicle collision, we can help. Call the Robinette Legal Group, PLLC today for a free, no-obligation consultation with an experienced personal injury attorney: 304-594-1800 or after hours, 304-216-6695 or visit our website to find answers to your questions. You don’t have to handle this alone. Questions? Contact Us Today & Learn How We Can Help. West Virginia Attorney Explains: How Long will it Take to Settle my Case? A common question I receive from clients is, “How long will it take for me to get a settlement?” The short answer is, if your injuries are minor, it can take just a few months to get your case settled. However, if your injuries are severe your injuries and may require extended medical treatment, the longer it will take to settle your injury claim. Insurance companies particularly require proof of your claim. We have to obtain medical records, employment records, expert reports, and those have to be synthesized and sent to the insurance company with the demand package and that process can take many months even for minor injury claims to resolve. If you settle your case too early, even a minor injury case, and you find out that you should not have settled it because there were other parts of your injury that you didn’t know about, then you are foreclosed forever from pursuing any additional amounts of recovery because you settled early. So, it’s best to be patient with the process in order to allow you to work with your attorney to make sure that all of your injuries are well established and documented. Then, when the claim is sent into the insurance company, the full value of your claim will be considered by the insurance company. So, always seek good legal advice as to when you should settle your case. Don’t take that decision upon yourself. 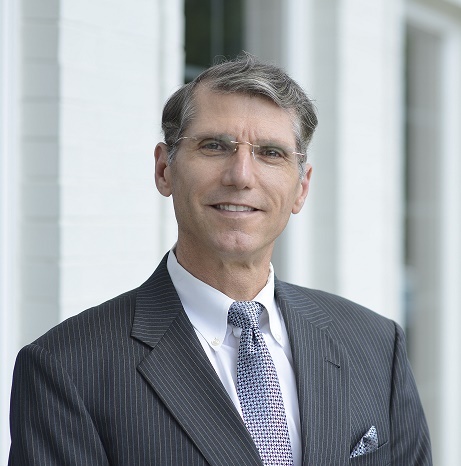 “Every good personal injury attorney wants his or her cases to move along towards resolution as expeditiously as possible but, every case is different and you never want to ‘sell a case short’ on value just for the sake of wrapping it up.” Steven M. Sweat, nationally recognized injury attorney. What if I already Settled My Case? Can I get out of it? For some of you, if you have already settled your case, the information in this post will only reinforce why you may feel so bad right now as you face all the problems that the insurance adjuster did not tell you about . The amount of money sounded good at first, but now that things have not worked out well for you, you have serious second thoughts about settling your case on your own . Let’s take a look at what can be done to address some of your concerns . The first question you probably are wondering is whether you can get out of the settlement. The answer is, possibly, but only if the settlement was agreed to within 20 days after the auto collision. West Virginia law allows you to void this settlement, but you must do so within 180 days from the date of the auto collision . If you reached a settlement more than 20 days after the collision, then the settlement is binding and enforceable unless you can prove that the insurance company defrauded you in some manner. If you have questions about personal injury claims in West Virginia, don’t hesitate to call our office for a free case review: 304.594.1800 or after hours, 304.216.6695. Visit our website for more answers to commonly asked questions about motor vehicle accident claims, insurance disputes, professional malpractice, and other personal injury claims. Author Jeff Robinette, Morgantown WV Personal Injury Attorney, has been designated as a Super Lawyer, National Board Certified Trial Attorney, member of the Multi-million Dollar Advocates Forum, and was recently selected as a Litigator Awards recipient, designating Mr. Robinette as a Top 1% attorney for personal injury and medical malpractice claims in West Virginia. Why You Should See a Doctor after a Vehicle Accident.